When I saw that the prompt for the weekly photo challenge was the word ‘blur’, I was instantly transported back to a dance festival I attended in Russia some years ago. It was the most amazing experience and included traditional dance from various ethnic groups which have settled in Russia over the centuries. There was Greek dancing as well as Armenian, and both were wonderful. But the most memorable was the cossak dancing. With their boots, blousy shirts and billowing trousers, the dashing cossaks perform a truly acrobatic dance full of jumps, kicks and bends. They really are a blur and photos are hard to take. However, I have some super photos of a dancer that I watched closer to home. Her name is Ann, and she gave up her day job to pursue the art of Egyptian Belly Dancing. Ann came to our WI and gave a fascinating talk about the history, myths, legends and meanings associated with this type of dance. She also told us about the costumes and how “Belly Dancing” got its name. Her fascination with the dance started when her Lebanese friends in London inspired her to find a teacher. She was learning classical Indian dance at the time. Over the last twenty years Ann has perfected her craft and she is now a very talented dancer as well as an inspirational teacher. When Ann dances it is spellbinding, beautiful, graceful and charming. Every movement is significant and tells a story. Her costumes were ravishing, colourful and exotic. To cover up she wears the traditional Egyptian Galabeya. She buys her costumes when she attends the Soukh or market at the Egyptian Hafla or party. Most of her costumes are made in Thailand or Turkey. 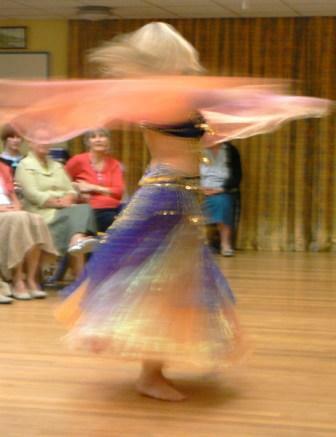 According to Ann, Egypt is considered the birthplace of belly dancing, but there are variations in different regions. She certainly takes her dance seriously. In order to get to know and feel the spirit of the dance, she spent time living in a Bedouin tent in the Sinai desert! She is an amazing woman and a beautiful dancer so I have picked her to illustrate this week’s post. This entry was posted in Dance, Musings, Performing, Photography, Russia, women and tagged Russia, Weekly Photo Challenge. Bookmark the permalink. Indeed they were x I love any style of dance but could never master belly dancing! Looks like she is having so much fun. Great exercise, that’s for sure. I watched a belly dancer once, and she was moving muscles that I didn’t even know existed! Must take a while to learn how to do that. Love it! I took a weekly “belly dancing” class at a local gym a while back and had so much fun. I was obviously not at the same level as this woman, but I can understand how people enjoy the craft. I always enjoyed watching the grace of the instructor when she would perform a routine. Nice way to capture this! Yes Anne is brilliant! I had a go and loved it but could never keep it up! Requires a lot of stamina! Excellent choice for the theme. Thank you and sorry it took me so long to show my gratitude for your interest and comment! Apt pic for the challenge. Other pics are very colorful and nice. Indeed- it’s a great way to keep fit and youthful if Ann is anything to go by! Goodness I’m impressed! My exercise consists of caring for my husband and running round after my 2 year old grandson! Consequently I’m not very fit!! I’ve been into sports and active my whole life. No grandchildren yet (neither daughter is married, so let’s keep it that way for now) to chase, so I have to resort to other methods. I enjoy walking and lifting, though, so it’s not onerous. What I love about these pictures are the wonderful blends of the colours of her costume, so vibrant yet subtle. Nice pics and what a good positive blog-title ! Thank you x life can be tough but I find bits of heaven are there in abundance if only we take the time to notice and appreciate them. Perfect pictures for the challenge! Thank you and I’m pleased you popped by to take a look at them. Nice! Motion photos and blur seem to transport one into their moment. Thank you for that lovely comment. Yes I’m enjoying seeing everyone’s take on the theme but it’s hard to keep up with so many! I keep thinking I want to get in on some of the photo challenges. I just have not decided to commit the time yet…and I don’t know where to find them. The link to the weekly photo challenge is on my post. Just click on the weekly photo challenge and all the details are there. It is not too onerous because you can use photos you already have. It’s fun! Thanks…I will be thinking about that!